The returning classes will be stronger than ever as the girls swimming and diving season gets underway this year, yet there is also a number of young, talented freshman joining the deck this fall. Southington will look for another season of success. Last year, the Blue Knights finished their regular season with a record of 8-2. Evan Tuttle will be in his 10th year coaching Southington. The Blue Knights are the only team to lose numerous talented athletes, including six-time record holder Olivia Fournier. Although it has lost a lot, Southington will be returning plenty of key swimmers. By the end of season last year, the Blue Knights broke five school records, had six conference champions and had eight named to the CCC West All-Conference team. Newington and Plainville are both looking to improve from last season. The Indians finished 3-7, while the Blue Devils finished 1-7. Berlin has welcomed Andrea Gallo as its new head coach and she is looking forward to another successful year. Last year the Redcoats finished 5-5 in the regular season. Gallo has many goals for Berlin, including focusing on building a positive team culture. Outlook: Last year the Blue Knights continued their success in the pool, including record-breaking times and conference championships. The Blue Knights will be led by a strong, veteran senior class. Abby Lo Presti, Lidia Prusak, Julia Holland and Julie Duszak will be leading the team as seniors. Also returning to the pool this year are State Open finalists Meghan Hammarlund, Maddie Symecko, Gianna Perugini and Andie Nadeau. Back on the board is Class LL qualifying diver Liz Beaulieu and joining the fall team from the winter is standout Sarah Meade. Outlook: Three-year assistant coach Andrea Gallo will be stepping up as head coach this year for the Redcoats. The Redcoats will be returning much talent, including seniors Gabby Pattavina, Nadia Humen, McKenna Evan, Alina Whiteside and Marisa Marquis. Along with the seniors, Berlin will be introducing a number of freshman. Outlook: The Indians are looking forward to a successful season with personal bests as well as school record-breaking times. Newington is returning the majority of its swimmers from last year and adding some strong freshmen. Returning to the pool will be junior butterflyer and freestyler Amber Rocheleau, sophomore sprinter Sarah Nadratowski, sophomore backstroker Gabriela Targonska and distance swimmers Julia Mazur and Lindsay Weaver. The Indians are adding some strong freshmen, including Christine Nguyen, who is expected to make key contributions in the 200 IM, while Erin Abrams is expected to contribute in the 100 breaststroke. Outlook: Plainville struggled last season with the loss of its senior class. The Blue Devils should be competitive in more meets this year. Plainville only lost one swimmer to graduation, Isabella Bantz. The team will be returning a number of veterans, including senior sprinter Lydia Weinberg. 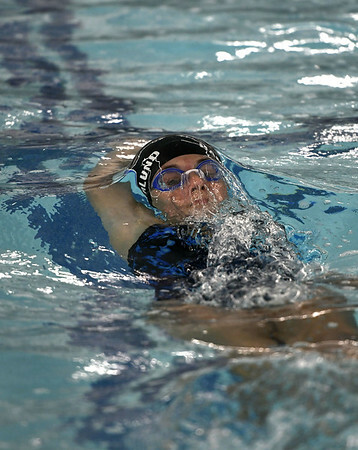 Last season she finished seventh in the state class meet in the 50 freestyle and ninth in the 100 freestyle. Posted in New Britain Herald, Berlin, Newington, Plainville, Southington on Monday, 3 September 2018 17:10. Updated: Monday, 3 September 2018 17:13.